Has there ever been a time when you couldn’t get your work done because of a messy desk? We all hope if we could get our desk tidy at one point or other. Whether you work at the office or in your home, an untidy workspace always kills productivity just as a tidy desk leads to a boost in it. I was once able to write only in cafés. I loved the experience because I had my favorite drink, Wi-Fi access and most of all, a nice clean wooden table all to myself. Many people told me they found it quite an expensive way to write and work. Though I understood their reasoning, I’m sure a lot of people would understand my preference once they saw the appalling state my work desk at home was in. It was a huge mess! Papers, electronic cables, books and DVDs were scattered all over my desk. Working with a desk like this was a real efficiency killer. How could anyone work when there was barely enough space for your laptop or PC? The lack of space wasn’t the only problem. I tried working on the bed in front of my desk, but the sight of the mess was a huge distraction. Seeing it made me think of other tasks that I had to do, which included organizing it. This caused me to lose my focus at the current task while it increased my stress level at the same time. The presence of several unread books and brand-new DVDs on my desk also frequently sent my mind wandering to the thoughts of doing other less productive activities. Soon, I realized I couldn’t go on like this. The once cost-free writing was becoming expensive. So when I had to tighten my budget and say goodbye to regular visits to my neighborhood café, I decided to start tidying my desk. Decreased expenses, minimized distractions and more space weren’t the only benefits of an organized work environment, though. Don Aslett, author of the book, The Office Clutter Cure, says that one of the biggest losses from messy work environments is respect. There is the assumption that people who have untidy workspaces have also lost control of their lives. I couldn’t agree more. After all, what would you think of your doctor or bank teller if they had untidy desks with instruments and bills strewn around? You’d probably think: If these professionals couldn’t tidy up their desks, then they probably can’t do their jobs properly! In fact, I’ve been embarrassed to ask family and friends over out of the fear of them seeing my desk. It might give them the impression that I’m not taking care of myself properly. For those working in the office, what kind of impression do you think you’ll be giving your bosses and colleagues when they see your messy desks? They would probably think you couldn’t handle your job or the promotion they were considering you for. 1. Clear everything out and start cleaning your desk. I like starting out with a clean slate. Remove all items from your desk and put them into a pile for sorting. This is also the best time to start cleaning. Use a damp cloth, duster or any other useful tool to wipe off any dirt or dust from your desk. The result of a clean and shiny desk is like the light at the end of a dark cave, enough to push anyone to continue with this tidying process. After this, you can place basic items like your PC or laptop and desk lamp back on your desk. Make sure the wires of these appliances pass through the back of your desk to avoid tripping over any of them. 2. Sort, then keep or throw. Alas, I found this the bloodiest part of the process, especially with the mountains of papers that I had. Despite that, I found this step incredibly beneficial because I was able to get rid of a lot of junk. The first thing you should do is to sort your items into different piles, one each for your papers, pens, etc. Next, start going through them and decide whether you should throw or keep them. Try to be reasonable while deciding. Do you really need that takeout menu from a restaurant that closed down five years ago? As for your office supplies, test your pens to see which ones have run out of ink. Throw out supplies no longer useful, like that broken ruler you had lying around. 3. Classify and store your files. Classify the papers that you’ve decided to keep according to time. Documents that you need for current work should be kept in your desk. Place them into different folders categorized according to the document’s nature or whether they are incoming or outgoing. Files not for immediate use can be stored in cabinets. 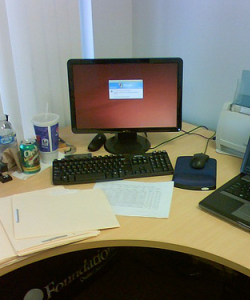 It’s always good to visualize how you want your desk to look like before putting any other items back. While doing so, remember that it’s better to put your documents and supplies within your reach. However, it’s also good to leave enough space between your items so that they won’t look too congested. Place your supplies in desk organizers or other space-saving holders to maximize free space. Also, remember to not put any distracting items like books and other entertainment materials back to your desk! You’re practically done! Now is the time to add some color and pizazz to your workspace by personalizing it. Display some picture frames of yourself and your loved ones. You can also add a few decorations like a small toy to make your desk look livelier. It’s not an easy process, but it’s worth it once you start having a desk that’s more conducive to work. Now that you have clean and tidy desk, just remember that maintenance is the key. Don’t procrastinate organizing your desk regularly or you might end back where you were at the start. How do you manage a tidy desk? Despite her business management background, Patricia’s true love is writing. Nowadays, she works as a freelance editor and writer online. Her writing interests lie mainly in culture, work productivity and travel. Email: patriciadjulian@gmail.com. When I worked outside the home I did make an effort to clean up my desk each day at the end of the day so I had a fresh clean desk for the next day. Your post is an inspiration to have a good clean out and start the new year with my old habit. Some great tips here, I too am guilty of a messy desk, I think you just end up getting to comfortable and end up leaving stuff everywhere. But your right I used to look at my desk every time I went in, in the morning and just wanted it to have some how been cleaned the night before. My office desk was in an absolute mess, with all shorts of things. After reading this article, I simply followed the steps you have mentioned. And, now I am feeling g8 at my work place. These are some great steps for sure. some of us have massive messy desks…… i really really am trying to do everything to keep it clean. Thanks for the article. hahah I actually even entered this contest for the messiest cubicle by contest factory. Its actually hysterical .. kinda funny. So true.. when im at work i make concious effort to keep my desk as tidy as possible, especially when im not at the desk. What would potential clients think if you were out on lunch and your desk was overflowing with papers and coffee stains, can be quite embarrassing. It may take 5minutes to do, but you will feel so much better for it and ready to crack on with your work instead of worrying about how messy your desk is! Lol, good one Torrey! But does that bother you?